» Who Is the Greatest ‘Saturday Night Live’ Cast Member Ever? 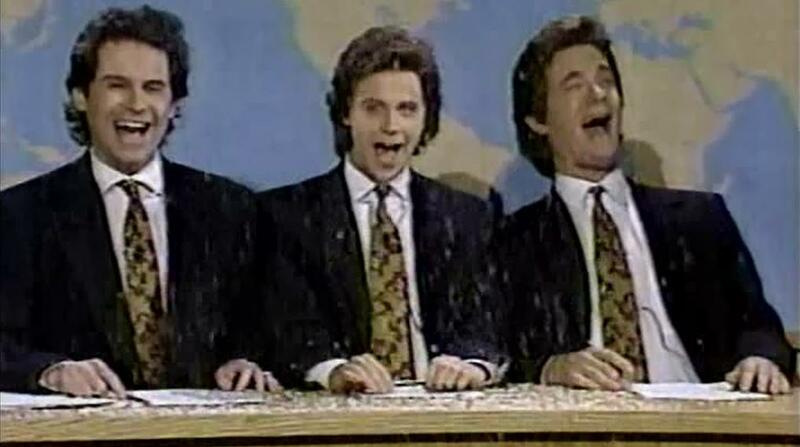 Who Is the Greatest ‘Saturday Night Live’ Cast Member Ever? And then, through those doors, Jon Lovitz was gone. Moments like these are why Jon Lovitz is my favorite Saturday Night Live cast member, forever and ever. If this story is true, and I believe it is, he is as I always imagined him. His essence was imprinted on me at a young age, surreptitiously watching SNL years before I was allowed and well past my bedtime. Members of the show’s ever-changing repertory company — 139 in all — can cast an unusual spell. For me, Lovitz’s “Tommy Flanagan, the Pathological Liar” character — an odd amalgam of Edward G. Robinson, Ratso Rizzo, and a drowned ferret — still transfixes. Decades on, the magnetic power of these people is undeniable. What is it, exactly? It has a little to do with comedy, a little to do with history, and a lot to do with the collision of those two things. Want to vote now? Click here to go straight to the bracket. “We did a show with Steve Martin (April 22, 1978) that probably came off as well as any single show that we’ve ever done. There was a thrill of feeling that everything went right, that we got all the breaks — it’s the only time I remember having that feeling.” That’s James Downey, the hallowed, longtime SNL writer best known for his mastery of the cold open. Downey said this in the book Saturday Night Live: The First Twenty Years, released 20 years ago. I suspect he still feels that way. 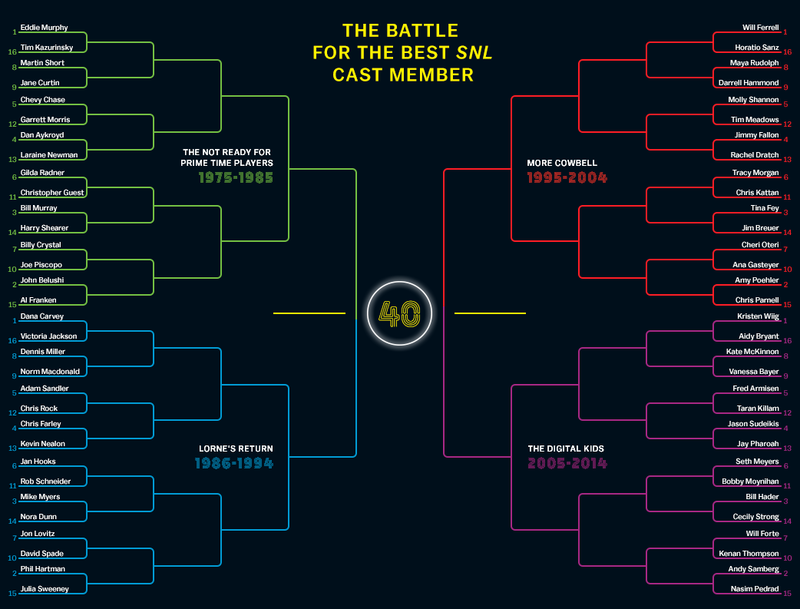 So, 40 years in, why do we still care so much about Saturday Night Live? Its threads of nostalgia are stitched deeply into our memory. And while a show that began as counterculture slowly became culture culture, the mythology has only grown. SNL may never be as special to you as it was when you first discovered it, huddled alone and marveling at Will Ferrell or Gilda Radner or Eddie Murphy or even Rob Schneider. The quest to determine which cast member is “best” may seem frivolous. But everyone’s got a favorite. Because while SNL may not be the star-making factory it once was1 — it retains a kind of glow and a roster-watching cottage industry that resembles fantasy football for bloggers. When cast members are fired, along comes a trundle of think pieces examining who and why and how could they? But if you’re really good, when you move on after a lauded run, you might get to dance with your boss on TV. This is a wholly unique, wholly contained biosphere composed of fascinatingly strange people who sleep all day and work all night. Even at its worst, the show is imperfect perfection — even when no one’s watching and another “Saturday Night Dead” autopsy finds its way onto newsstands. That’s largely because of the people on your TV screen. And as Downey noted, all they do is fail. Except sometimes they don’t. To see the expanded version of the bracket and vote now, click here. Over the course of the next seven days, we’re asking you to vote for the cast member that you obsessed over, that you foolishly followed into movie theaters (R.I.P., Tim Meadows fans), that you always swore had a breakout season on the way (we hardly knew ye, Michaela Watkins). And along with those votes, we’ll tell some stories about former cast members’ lives, explore the show’s forever-unraveling arcana, and prognosticate a bit about the future of what has become, curiously and four decades later, NBC’s crown jewel of original programming. So vote, read, immerse yourself. You’ll feel better about something you loved … or fall in love all over again … or love Saturday Night Live even more than you thought possible. As segmented as popular culture has become, the generation that joined the show between 2002 and 2006 — highlighted by genuine Hollywood figures Andy Samberg, Kristen Wiig, Fred Armisen, Jason Sudeikis, and Bill Hader — now seems miraculous. JK. Sorry again, Dennis Miller.